Fibrecoat is our most versatile fibreglass roofing system and is ideal for all flat roof types, sizes and specifications. The naturally curing polyurethane system can be applied to new roofs or directly over existing surfaces like felt, concrete and asbestos. The Fibrecoat roofing system is cold applied and removes the fire risks associated with traditional roofing systems that rely on an exposed flame. 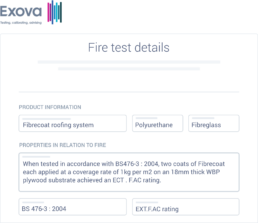 Fibrecoat has passed strict fire retardancy testing and complies with all current UK building regulations when applied in accordance with application guidelines. Tests performed at fire specialists Exova confirmed that Fibrecoat achieved the highest standard in fire retardancy. 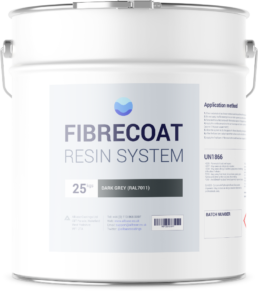 Fibrecoat has been engineered with our FibreFlex technology to give unparalleled flexibility over standard GRP roofing systems and does away with the need for expansion joints. Additional flexibility will help the system deal with any thermal expansion and contraction as the roofing surface heats up and cools down throughout the day. Find out more about how Fibreflex technology increases surface flexibility without affecting performance. Unlike traditional fibreglass roofing systems, Fibrecoat bonds to virtually any surface and can be used as an overlay system for roofs in need of refurbishment. Along with the traditional OSB boarding, Fibrecoat will cover surfaces like asphalt, concrete, brick, felt and slate without the need for a primer while other materials like lead, metal, aluminium and asbestos can be overlaid using our PU or epoxy based primers. For more information on the different types of surfaces Fibrecoat can be overlaid to, check out the Fibrecoat substrate guide. Unlike a standard GRP system, Fibrecoat doesn’t require any activators or catalysts to work, instead the system cures naturally with the atmosphere becoming watertight in around 30 mins, making it much more user friendly and a lot safer. The Fibrecoat system has built-in inhibitors that withstand ultraviolet and solar degradation, which provides protection and maintains the high quality finish over the course of the roofs life. The Fibrecoat system cures with no joints or seams to create a durable, long-lasting surface that can handle general foot traffic and balcony furniture. A Fibrecoat roof is built up from layers of high performance resins and fibreglass to give its unique strength and durability. Depending on the type of roof surface and the level of foot traffic the system can be adapted to increase strength and maximise performance. The best guarantee is the one you'll never have to use, but just in case our Basecare protection has you covered. Fibrecoat is protected by our industry-leading Basecare guarantee that includes a range of benefits from standard product protection, approved contractor installation cover and our unique first 5 year Basecare+ warranty.